Kitchen remodeling can be a lot of work, so it’s good to have a contractor on your side. Before hiring someone, here are some things to consider. Before starting your remodel, determine how much money you can spend and pledge to stick to this amount. That way, you’re less likely to splurge on extras and run out of money before your kitchen is done. If you go into your project without a clear style, you could end up with a kitchen that looks disjointed. To have a coherent look, you need to think about the styles available and which ones you like. For example, do you want a stark, modern look or something cozy and rustic? 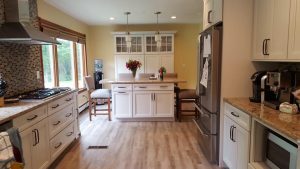 Flooring often gets overlooked in kitchen remodeling plans, which is a shame since everyone uses it all the time. You will want something that pairs durability with style. If your floor will have a lot of foot traffic, lean heavily toward durability to save yourself money in the long run. Whether your kitchen is used for entertaining, cooking or both, you need adequate lighting. You need to decide between natural light and artificial, or some combination of the two. Spaces that get used a lot, such as a sink or stove, often benefit from having an extra light source. Once you know what you want, your contractor is an important part of making it happen. Take the time to review references, both those from the contractor and found through unbiased sources. When you have a trustworthy and experienced contractor, your kitchen project can progress much more smoothly. To get the kitchen you want, you need to think about style and function. Kitchen remodeling isn’t a task to perform by the seat of your pants, so make sure you are ready and have a trusted contractor by your side.